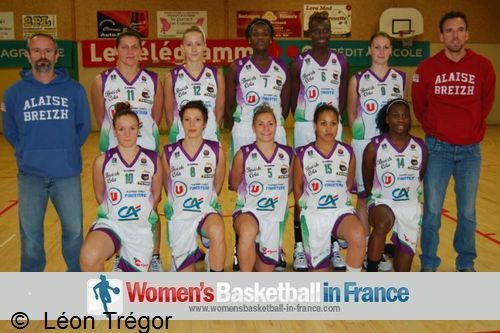 Today the top club playing basketball in Brittany (Bretagne) is Léon Trégor 29 in the Ligue Féminine 2. Yet just five years ago in 2007 the club roster was made up of mostly school teachers, students and public service workers. Pleyber-Christ struggled during their first three seasons in the second division (NF1). But once they opened its doors to the professional nature of women's basketball in 2010 in order to become more competitive in the Ligue Féminine 2 (LF2), things started to change. In 2011 the conversion to professionalism was complete with Pleyber-Christ uniting with EO Landerneau to form the club Léon Trégor 29. However certain aspects stayed the same: nobody likes to play in the hall in Pleyber-Christ during the colder months of the season, while the coach Franck Simon and the player Aude Kernévez continue their basketball in Brittany for Léon Trégor. Aude Kernévez is the captain of the team and has been with the organisation since 2005. 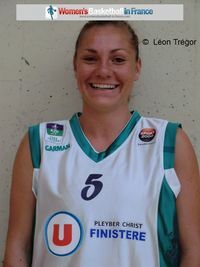 She is the only player left from the team that won promotion from NF2 in 2006. Kernévez hes been playing basketball in Brittany for 15 years and is regarded as one of the best point guards in the LF2. However she is more than the captain at this club. She is often seen cheering players from the academy to settle in the new surrounding and helping them with their homework. Last season she had one of her toughest assignments in keeping the team together after the death of youth player Charlène Gélébart (19 years old) with Kernévez herself just 22 year old. In 2011-12, Léon Trégor had ambitions for a top 4 finish but injuries and and point deductions made their task impossible. Three of last season's signings have left the club: Elsa Martins, Céline Girard, and Léa Beaugendre. This season they are longing for a place in the top 6 and have brought in four new players, all under the age of 23: Manon Cuomo, Cécile Baudy, Leslie Matanga and Witney Miguel. Mélissa Huet has been promoted from the academy team. Emilie Croguennec who has been at the club longer than Kernévez may join the team in case of injury. Franck Simon and Gurvan Morvan continue their function as coaches while Oumou Kalsoum Touré, Marie Butard, Marie-Julie Levant and Adrianna Gresnerova return. With everything in place, Kernévez, having completed her higher education studies last year, has now the task of taking basketball in Brittany to the LFB. Le club Pleyber Christ - évoluant en tant que seule équipe féminine en L2F en Bretagne - devient Léon Trégor 29 en se réunissant avec EO Landereau en 2011. L'ambition du club familial avec un budget modeste de 400 000 Euros reste le même. Son capitaine Aude Kernévez, seule survivante de la formation de Franck Simon en NF2 en 2006, se lance encore une fois à la chasse pour un top finish en L2F ou même une promotion en Ligue féminine de basketball. Il reste que cinq joueuses de la saison dernière dont Kernévez, Oumou Kalsoum Touré, Marie Butard, Marie-Julie Levant et Adrianna Gresnerova. Pour compléter l'ossature, il s'y joigne Manon Cuomo, Cécile Baudy, Leslie Matanga et Witney Miguel, toutes moins de 23 ans, et une joueuse de l'académy Mélissa Huet. Une ancienne joueuse sera à disposition en cas de blessure avec Emilie Croguennec. Reste à voir si l'équipe pour cette saison est bien huilée pour s'imposer et se qualifier pour le Final Four.